In less than a month local elections will take place in Greenwich and other London boroughs. Candidates are walking the streets, leaflets are being dropped and voters wooed. 853 has listed the full range of candidates. So whilst local politicians push leaflets and manifestos now is a timely reminder to look back and see what was said four years ago by the party that has been in charge since then across the borough – Labour – and what has happened. Firstly, lets look at the contentious current issue of local environmental quality. What did Labour’s 2014 election manifesto in Greenwich say on this issue? Healthy? Safe? Clean and attractive? I think we can chalk up many failings on that front. Car-centric retail parks have continued to be approved since 2014 with resultant income from developers to improve local areas generally not spent. In terms of the environment around housing, entire estates have been neglected for years. In fact, the Housing Department has seen numerous failings and missed targets which have persisted. One of the biggest problems is an almost complete absence of routine maintenance is some areas. Since 2014 I’ve covered large-scale issues at estates such as Barnfield here and Glyndon here. Again, another fail. The public realm in many places ranks as some of the worst in London. Greenwich town centre is probably the only area where quality is good across the board, and that drops off a cliff as soon as leaving the very centre and approaching Deptford or east Greenwich. The repercussions of such poor quality streets, estates, shopping parades and general public realm impacts heavily upon the amount of people walking and cycling with resulting problems of poor public health. 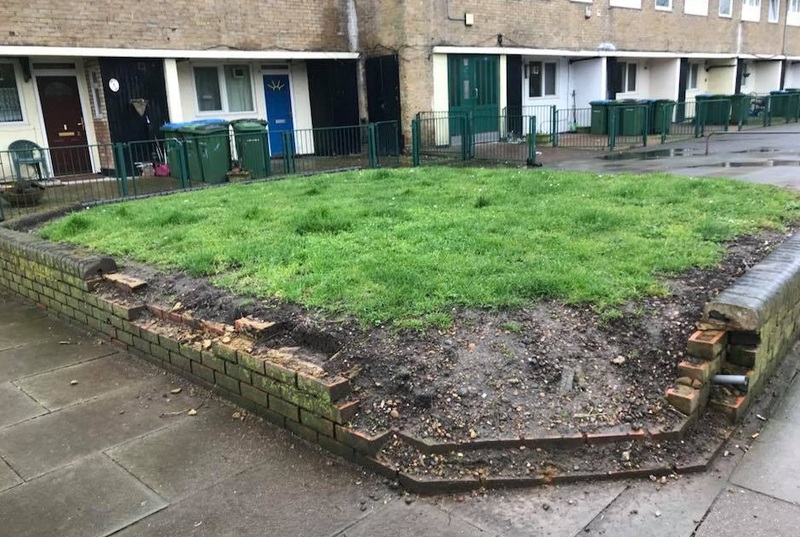 In east Greenwich pocket parks are being consulted upon (and it’s welcome to see details up online) but it’s barely touching the surface of systemic public realm design failures. 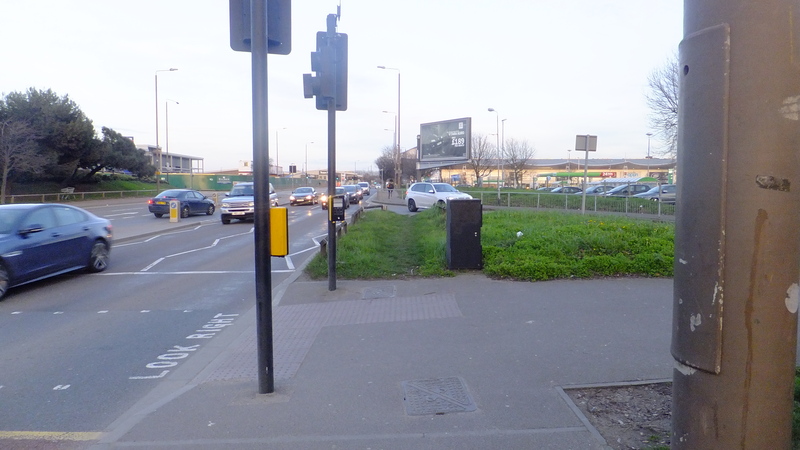 Google Streetview shows the area above – in Abbey Wood – to be like this since at least 2012. Other nearby areas are similar and I have been contacted by residents who have notified the council for years on these issues, many times, and nothing has happened. Labour campaigners and candidates have taken a fair few pictures of themselves canvassing on the same estate. So how can they, or the Housing Department, miss this? 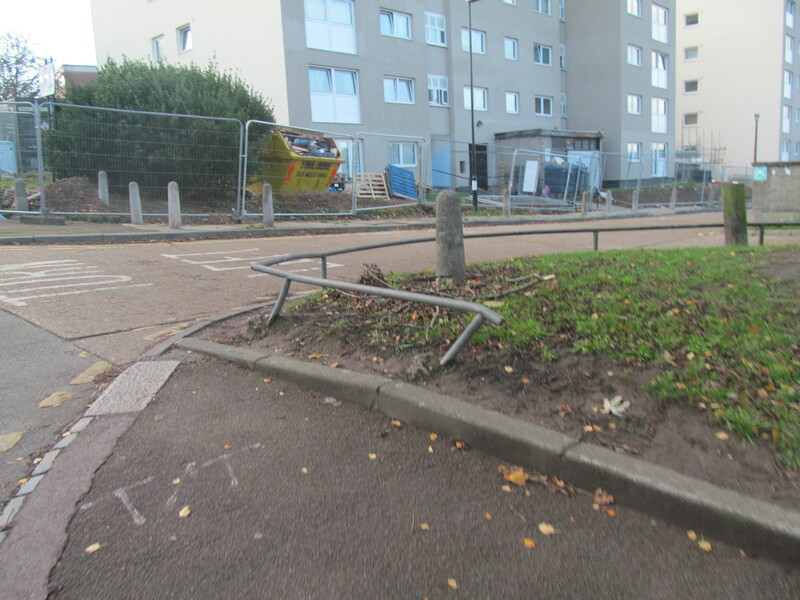 This is the same estate where TfL gave Greenwich Council £120,000 to spend on improving the main road in financial year 2017/18 yet no work has been undertaken, nor even any consultation. Broken fencing goes on for a couple of hundreds metres. It’s an eyesore and dangerous. Fly tipping is common beside it. Given that poor maintenance encourages other antisocial behaviour it’s no real surprise. And here are Labour councillors and campaigners on a spot not too far away. 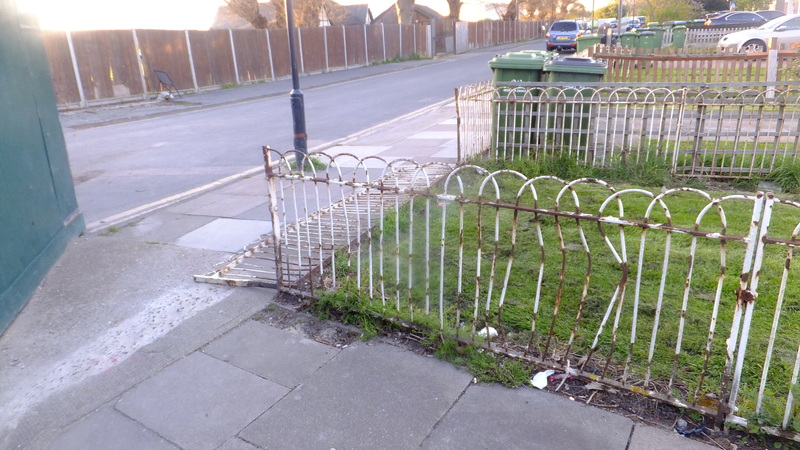 To be fair the council did replace many areas of fencing yet large parts lie untouched. Surely they cannot be ignorant of poor conditions across the estate? One of the few areas where money does always seem to be found is for random wooden bollards thrown up with no apparent rhyme or reason. Asking questions on these issues usually results in a wall of silence from Labour Greenwich councillors. On the flip side, Abbey Wood did see £75,000 from Greenwich Council for Wilton Road (though its not finished) which was match funded (£75,000 from Bexley Council and £150,000 from the Mayor of London) and Greenwich Council recently allocated £2.5 million for Plumstead High Street alongside £2.5 million match-funding from the GLA. Back in 2014 the authority said they would use Meridian Home Start to build homes. Yet over the last four years the numbers built using Home Start are tiny compared to many other Labour councils in London, with future plans far more modest than other areas. Central government restrictions on local authority borrowing mean Meridian is one of the only tools to build many homes and quickly. It isn’t being used anywhere near enough. Instead huge sums are being used to push prices of existing homes higher through spending £65 million buying existing homes off the market – which the council’s own figures show is the least cost-effective option by some margin. Poor conditions with private rentals is another huge and increasing issue. Greenwich Council eventually implemented licensing of Homes of Multiple Occupation in Autumn of 2017 (though only 2.6% of landlords had registered by the end of January). This was years after many other London Labour councils implemented measures, and even now they havn’t taken the further option of licensing all private rentals in the worst 20% of wards for known issues. With the next election under a month away the same things from 2014 are being said and heard again. But will anything change? Will any councillor address these issues and failing departments? For years they’ve not addressed systemic and chronic failings. Election literature this time around again points the finger at the Conservative government. In many cases they have a point, but there’s little on how they will use their own powers and funds to improve the life of local residents. Passing the buck all the time isn’t an answer. And not when other Labour councils in London show what can be done. In coming days and weeks the site will look at current manifestos from the main parties and how challenger groups are emerging, including independent residents parties such as the newly formed Plumstead Party. It cannot help that Council leader Denise Hyland lives in Eltham but is councillor for Abbey Wood ward. In fact two out of three Labour cllrs for Abbey Wood since 2014 live in Eltham. The other cllr barely ever communicates with residents via any method – email, social media, you name it. You cannot get further away geographically from Abbey Wood in the borough than Eltham, nor socially/economically (the estate in particular which has declined since the 90s as Greenwich ignore it). An elected representative that lived in the town and saw these things would do something about it. It’d be nice to see any comment on here. All are welcome to. But people will still vote them in … it’s the “my nan voted Labour, my dad voted Labour, I vote Labour”…mentality. If people want change, they are going to have to stop voting for the old incumbents and choose a different party, at least for one election, just to make them up their game. It’s no use people moaning here and then voting them back in again. They won’t change if they know they are going to win. I WILL NOT be voting for labour – I will be voting for change, my goodness we need it! Labour needs to be swept away in Greenwch. Shame on the ‘party of the people’ showing so little regard for its constituents. Life long Labour voter here but the local party needs a shake up and FAST. “To achieve Croydon’s goal of 1,000 high quality new homes across the borough by 2019, the council has like several other forward thinking boroughs set up its own development company, Brick by Brick. Brick by Brick is a private, independent company, with the council acting as sole shareholder. It aims to deliver high quality, new, residential-led development on a range of sites across the borough. As well as being able to make sure the borough fully benefits from land value uplift and development returns, Brick by Brick will be able to deliver directly and act quickly to new opportunities in the market place. By 2019 Greenwich will have built about 100-200 in 5 years. But then turkeys don’t vote for Christmas and a fair few Greenwich politicians are landlords or multiple homeowners. Surely a conflict of interest? As I said – a Labour council? No, more Tory than most Tories in action if not overt policy. I am thinking of not voting Labour (for the first time). I am really fed up of living in one of the “poor relations” wards. Woolwich Dockyard won’t be getting Thameslink, I have to pay a premium to use the train service due to the Southeastern rail franchise; traveling from Dockyard to Canary Wharf via Greenwich DLR should cost £1.70 (zone 2-3) but instead I have to pay the Southeastern premium or 161/472 and Jubilee line. The hassle Street Feast was given to open up, you wonder what else is being stifled on the neglected Woolwich High Street. We have begged for Woolwich Arsenal to be rezoned, it didn’t happen, I would love an actual dedicated cycle path from Woolwich to London Bridge, instead it stops in Greenwich. I hate the fact so many of the councilors live in Eltham, ELtham gets a giant wooden sign, Plumstead can’t get their streets cleaned. If there is an independent running for Woolwich Docky I am going to give them my X, providing they aren’t mental racist. @Tim: er, I don’t understand why if you are travelling to Canary Wharf, you don’t go to Woolwich Arsenal for the DLR? Because I live by Woolwich Dockyard in Zone 3 , Woolwich Arsenal is in Zone 4, Canary Wharf is in Zone 2, I want to travel from Zone 3 to Zone 2. If I take the DLR from Woolwich Arsenal to Canary Wharf it will cost £2.40, whereas not paying the premium of using Southeastern and going to Greenwich and getting the DLR would mean I would just use Zone 2-3. Because for some reason I can’t understand I have to pay a premium to use southeastern to travel from Woolwich Dockyard to Greenwich, so a £1.70 journey would be £2.60, an extra £9 a week which I would rather have in my pocket. What I would really like is a cycle path from Woolwich to Canary Wharf (an actual segregated route) So I don’t have to use the lesser TFL product offered to South East London than any other area of London. Having read the brilliant reports on this issue and other issues raised on this site I will not be voting Labour. When it came to the decent home programme a couple of years back some council homes on my road got new kitchens new bathrooms new roofs and new pebble dashing. Other homes rented from the council including my own house built at the same time received no improvements at all. I just do not understanding Greenwich Councils housing policies or how tenants get treated so differently by them. I no longer live in the Borough, but never voted Labour and have not done so for many years. I would like to think that the recent unfavourable publicity that Labour has been attracting would give people pause for thought at the ballot box but sadly, I don’t think so.